HESS J1534-571: A new TeV supernova remnant shell discovered with H.E.S.S. Fig 1: TeV surface brightness map of HESS J1534-571 derived with H.E.S.S. The green ellipse denotes the extension of the radio SNR candidate counterpart G323.7-1.0. The inset on the bottom left denotes the point spread function of the TeV analysis. A shell-type appearance is suggestive from the map and is numerically confirmed. Due to the statistical uncertainties we cannot say whether the TeV emission significantly deviates from a flat azimuthal profile, despite the asymmetry of the TeV source that might seem apparent from the map. The stellar ejecta that are expelled during a supernova explosion form an astrophysical object called supernova remnant. Through the interaction of the supersonic ejecta with the surrounding matter, a shock is formed that compresses and heats the surrounding medium overtaken by the shock. At these shocks, particles are accelerated to high (relativistic) energies. Supernova remnants are considered the main sources of such relativistic particles (called Cosmic Rays) that are prevalent in our Galaxy. To date, about 300 Galactic supernova remnants are known. Most of these remnants have been discovered over the last decades with radio telescopes. The radio light that these telescopes detect from supernova remnants is emitted by relativistic electrons with GeV energies (1 GeV = 109 eV; 1 eV is the typical energy of a visual photon, which the photon obtains from transitions of electron states in atoms). A handful of supernova remnants are also known to emit X-rays, detected with satellites orbiting the Earth. A few of these objects have even been discovered (i.e. detected for the first time) in X-rays, since their radio emission is so faint that they have not been detected in radio surveys before. The youngest of these remnants (with ages of up to several thousand years) emit non-thermal X-rays, a specific type of X-ray radiation which comes from electrons with supra-TeV energies (1 TeV = 1012 eV). From these observations, it is well-known since the nineties that supernova remnants can accelerate electrons to multi-TeV energies, reaching almost the ballpark of ~1015 eV particle energies which are the highest energies to which Galactic Cosmic Rays are thought to be accelerated by supernova remnants. But what about protons and heavier nuclei? The vast majority of energy in Cosmic Rays is contained in these particles. We cannot say that supernova remnants are the sources of Galactic Cosmic Rays until we have shown that they also accelerate this (nucleonic) particle species up ~1015 eV particle energies. To directly observe these nucleonic particles in the accelerating sources, GeV to TeV gamma-ray observations are necessary. And indeed, in the last years several of the known (young to middle-aged) supernova remnants have been found to emit gamma rays, either in the GeV-band (with the LAT instrument onboard the Fermi satellite) or in the TeV band (with H.E.S.S. and other Cherenkov telescopes). One of the most prominent examples is the young supernova remnant RX J1713.7-3946, which is also a bright X-ray emitter (the name RX J1713.7-3946 stems from the fact that the object has been discovered with the X-ray satellite ROSAT). RX J1713.7-3946 is both a GeV emitter (the GeV photon emission comes from particles with ~GeV energies) and a strong TeV emitter (TeV photons are emitted from supra-TeV particles). However, the puzzle related to the identification of the objects responsible for the acceleration of Galactic Cosmic Rays, specifically the highest energy hadronic Cosmic Rays, is still not fully solved - Nature has given us a challenge. The GeV-TeV photons can stem from GeV-TeV hadrons, but they can also come from GeV-TeV electrons (the same particles that emit radio to X-ray synchrotron photons). To discriminate between hadrons and electrons, we can exploit certain spectral signatures both in the GeV (the "pion bump") and the TeV (detection of a hard, "pevatron"-like spectrum) band. In the last few years, GeV gamma-ray emission likely produced by hadronic particles has indeed been reported through the detection of the "pion bump" from a handful of supernova remnants, e.g. . For TeV gamma-rays, however, the emission that we see from many young TeV-bright supernova remnants (like RX J1713.7-3946) cannot be unambiguously attributed to emission from hadronic particles. It is equally possible that the emission from TeV electrons is much brighter in these sources. This is corroborated by the fact that we see bright X-ray synchrotron radiation from TeV electrons in these sources. We find ~100 TeV emission from particles with PeV energies (1 PeV = 1015 eV) from the very youngest of the supernova remnants (or, in other words, the "pevatrons" amongst the supernova remnants). At these energies, emission due to electrons is deeply suppressed from fairly basic principles. However, so far no supernova remnant pevatron has been found. Second, some young supernova remnants might interact with dense molecular clouds, and therefore the hadronic emission is strongly intensified in the gamma-ray band. This may be the case for example in the supernova remnant W49B. Or, finally, we find new, TeV-bright supernova remnants whose characteristics are between young and middle-aged. Being in such a transition phase, they may still confine loads of TeV hadrons in a shell structure, while the TeV electrons have already vanished due to cooling effects. Fig 2: Radio surface brightness map (in units of mJy per beam) showing the new radio supernova remnant candidate G323.7-1.0. The image has been derived from the second Molonglo Galactic Plane Survey (MGPS-2, Green et al 2014 , where the image was taken from). The small blue circle on the bottom left is the beam size, i.e. also a measure of the point spread function. HESS J1534-571 could be one of such "transition" sources. The object has been discovered as a new TeV source in the course of the ongoing H.E.S.S. Galactic plane survey already a few years ago (though not published at that time). When the source was first analyzed, there were no counterparts found in other wavebands. But its shell-like morphological appearance is quite similar to other, well-identified TeV-emitting supernova remnants. A systematic search for shell-type morphologies in the H.E.S.S. survey data has indeed revealed a small number of supernova remnant candidates, and HESS J1534-571 is one of them . There are no other signatures in the TeV data that could help to identify the nature of the new object. Therefore, from the H.E.S.S. data alone the source could only be classified as a supernova remnant candidate, and not as a firmly identified supernova remnant. 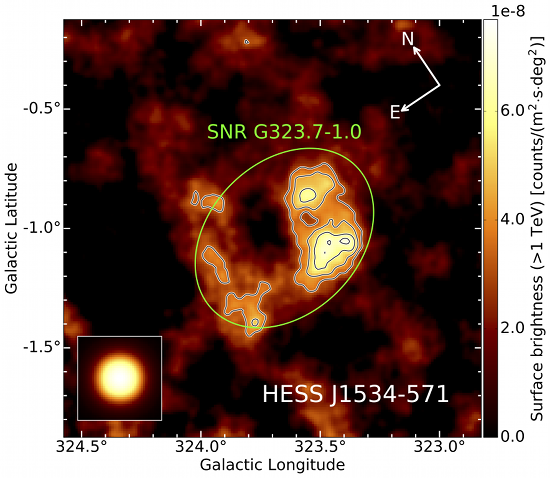 Luckily, however, in 2014 Green and coworkers independently published a list of new supernova remnant candidates , using radio observations of the Galactic plane with the Molonglo telescopes in Australia. 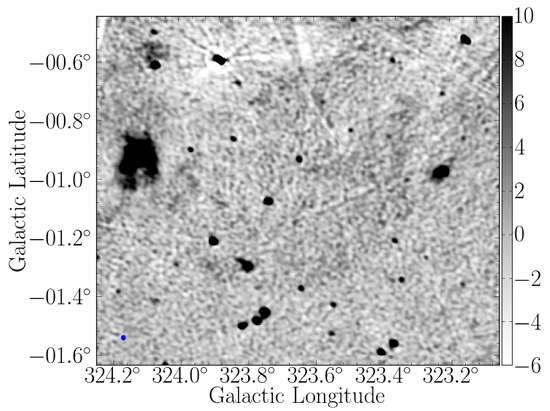 Amongst these radio supernova remnant candidates, one source (G323.7-1.0, see Fig. 2) is an excellent counterpart to HESS J1534-571, because the morphologies of the two sources are - taking statistical errors and the different angular resolutions of the instruments into account - practically identical. This means that the two sources (the radio source G323.7-1.0 and the TeV source HESS J1534-571) are just different views of the same object, which is a newly discovered and confirmed supernova remnant. The TeV energy spectrum of the source is shown in Fig. 3. It does not allow to judge whether the emitting particles are electrons or hadrons. There is also no indication from the spectrum that the source is a (hadronic) pevatron. 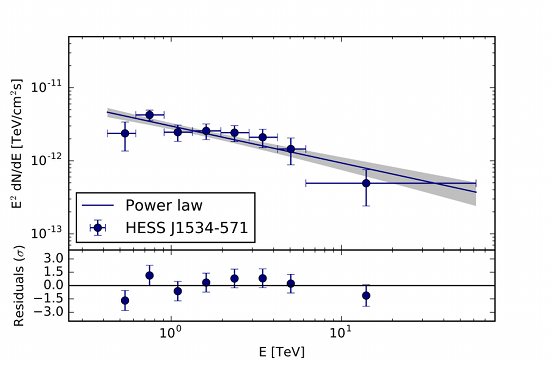 Fig 3: Spectral energy distribution of HESS J1534-571 in the TeV band, derived with H.E.S.S. Why may one consider HESS J1534-571 to possibly be a "transition" source between young and middle-aged supernova remnant? Because it is TeV-bright, there is no obvious interaction with molecular clouds, and no X-ray emission from the source has been found. While HESS J1534-571 shares for example many properties with the supernova remnant HESS J1731-347, which is bright in TeV gamma-rays and in X-rays , no X-ray emission could be found from HESS J1534-571 in several Suzaku observations of the source (see Fig. 4). Can we therefore firmly conclude that HESS J1534-571 is not an X-ray synchrotron emitter, that therefore no TeV significant relativistic electron population is contained in the source any more, and that therefore all TeV photons that we see with H.E.S.S. are happily coming from hadrons? Not yet, unfortunately. While the indications are suggestive for such an interpretation, it turns out that it is very difficult to exclude that there is relevant X-ray emission from a source like HESS J1534-571, even with the current generation of highly sensitive X-ray telescopes (such as XMM-Newton or the recently decomissioned Suzaku satellite). One of the main reasons for that is the large angular diameter of HESS J1534-571 of ~0.8 degrees, more than 1.5 times the size of the moon in the sky. This is no problem for instruments like H.E.S.S. which have a field of fiew of 3 degrees diameter (>70% of peak gamma-ray acceptance), but is a challenge for current X-ray satellites which have much smaller fields of view of ~0.3-0.5 degrees. 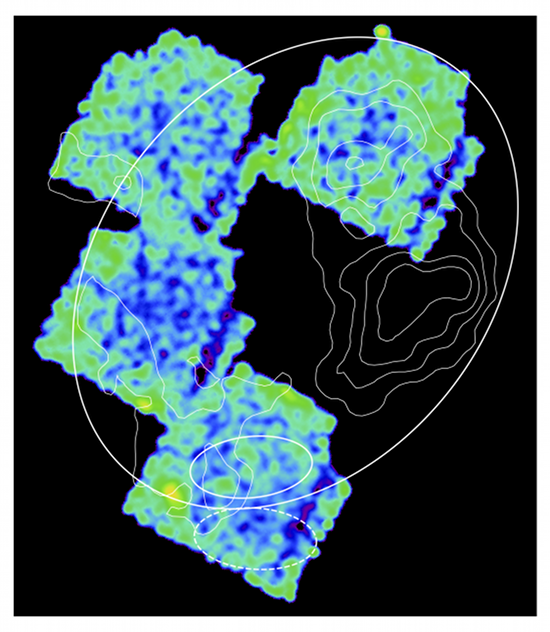 Fig 4: Sky map of the Suzaku X-ray pointings towards HESS J1534-571. The colored fields correspond to the four different pointings that the Suzaku X-ray satellite performed to map parts of the source. The observations revealed no X-ray emission from the source. The ellipse and the contours correspond to the radio source size and the TeV emission levels, respectively. So, to conclude, it is great news to welcome with HESS J1534-571 a new member in the small group of confirmed TeV-emitting supernova remnant shells. But we need more and better observations of the object also with other instruments to pin down the nature of the particles in the source that we see radiating TeV gamma-rays with H.E.S.S.